Exploring the intersection of responsive dynamic form & human spatial perception. The stark white cloud comes to rest on the green overlooking the park; an alien, yet strangely familiar object in the landscape. The striated shifting form plays at the intersection between foreboding mass and a moving vapor as it translates dynamic human motion into habitable form. Layers of Bio Mass undulate and fold across the enveloping surfaces. Voids emerge, shed their lights forms, and disappear back into the solid mass. The Laminar Cloud is a study in using computational simulation to drive a form finding process. The results is always in flux, searching for a resolution between our continuous experience of space and our fragmented focus on wondrous moments; space, time, & light converge. A series of abstractions of the human form into a primitive mass with minimal operation of movement and perception established the base search agent for the experiment. 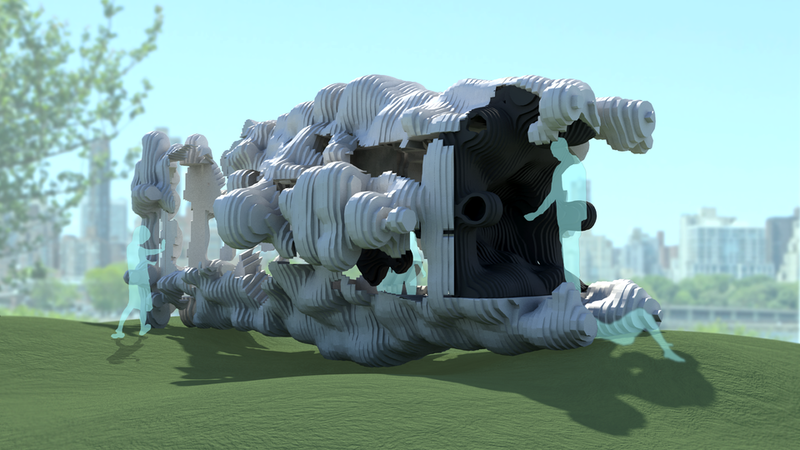 A human scaled rectilinear volume with the capacity to move forward & backward along a single axis with varying speeds and general body positions simulates changing conditions of spatial inhabitation. The abstracted human gains more capacity as it can adjust its focus at key moments along the journey through space. These moments become voids, slices through the solidifying memory of the movement. Qualities of motion leave a trace, a memory of the body. That memory transforms our perception of space and shapes our world. The form is discovered through studying a body in motion in time, the material and construction method serve to provide a frame of measure. The relentless striation of laminated sheet forms exaggerates the speed of the changing Body Transforms. The jagged nature of the repetitive edge reminds us of the search for grace in our movements. Computer simulation plays an increasing role in architecture at a technical and playful level. With this project I am able to explore a vast range of generative solutions to a contemporary architectural folly that explores our movement through space and perception of time. This work exists as a continuation of formal explorations seen in works such as Greg Lynn’s Predator or Francois Roche’s Hypnosis Chamber. My extensive background in digital fabrication technologies, building projects around the world for designers and architects like Zaha Hadid, Diller + Scofidio + Renfro, SU11, and many more, gives me a unique insight into fabrication and assembly efficiency while achieving design intent. CNC (computer numerically controlled) technology paired with standardized building materials can yield complex results quickly and with a low budget. My current thinking is to source a biodegradable building board (vegetable pulp particle board) that could be treated with paint for the duration of the sculpture and then disassembled. The decomposed segments could then be used as perimeters for planters housing mulch and dirt for trees and raised beds. Betancourt Green Building Supplies here in Brooklyn has a BioBoard, Agristrand, which is primarily soy chaff and is FSC certified. It uses a non-toxic binder and will break down over time.